This video seems to be popular today. It's the age old question of how technology distances us from the moment and the apparent lack of sociality. But I don't really see a problem here. This is only a problem if you assume that face-to-face communication is the only real form. What I see here is a generational problem, not a technological or a communicational. We have been brought up in a world where face-to-face communication was the only viable form that we had. Today that's no longer true. And, we are now learning how to live our lives in a world where communication is not a product of a short geographic distance. There are some scenes that makes me cringe. Like the one where two girls have a drink, or the bowling scene ... she really needs to get some better friends. But that has nothing to do with our phones. You could reproduce all those scenes 20 years ago, as well. Not paying attention to others has always been a problem throughout the history of humanity. But there is another story to this as well. Take the scene of the two kids on a swing. 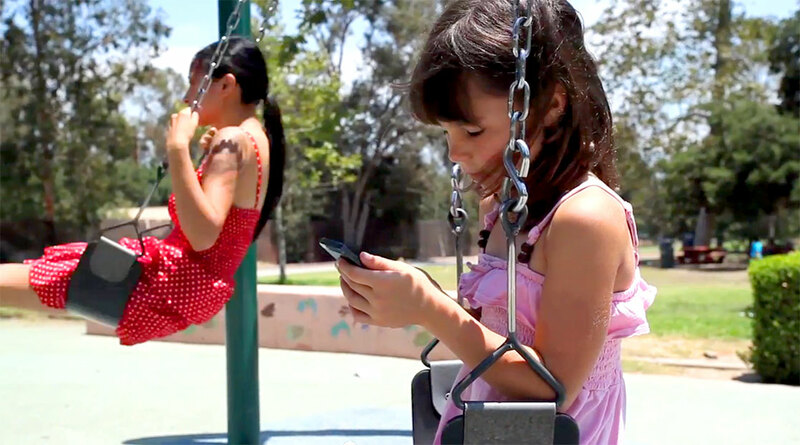 One is having fun swinging while the other is using her phone. If you are from the old generation (which we all are), you are probably thinking that this is terrible. Why isn't she playing with the other kid? Oh no... she must be lonely! This is the old way of thinking. The way in which people think kids can only be social if they adopt an extrovert face-to-face lifestyle. But that kid might be more socially engaged than the other kid. She might be networking. She might be catching up on something that really inspires her. She might be creating the basis for her future dreams. The other kid is just playing on a swing, how boring is that? That's really the point of this. We are learning that there are more than just one way of communicating. We are learning that face-to-face is kind of limiting. We are learning about the power of both introverts and extroverts, and how they interact in different ways. Or just look the main character. I see a woman who is living a very boring life. Look at her activities. Staying in bed doing nothing, exercising, going out to a coffee shop, walking on the beach alone, having a drink, bowling, and going to a bar. This woman doesn't seem to have a life. All those activities are things you do just to 'spend time'. Where is the passion? Where are her interests? What drives her to get up in the morning? What makes her focus and feel really excited about something? She doesn't have a life. She needs to find something that inspires her. Something can give her purpose in her life. And then she needs to join up (via many forms of communication) with other people with similar interests. She is not lonely because all her friends are playing with their phones. She is lonely because her chosen environment has no purpose. And this is the true story, I believe, of the problem of the old generation. Because of the limitations of face-to-face communication, many people couldn't do what they cared about because of the distance involved. As such, many people don't really have a life. They sleep, work, and 'spend time'. But they are never actually doing anything.